August 2011 – Theologians, Inc. 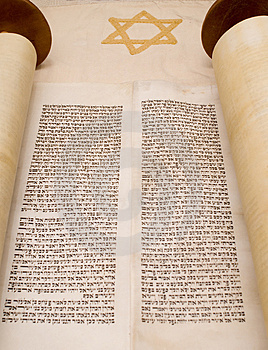 The Torah in Judaism is often thought to be strictly the Law, or a set of legal codes given to the Hebrew people by God to Moses shortly after the Exodus fromEgypt. Such an understanding is severely handicapped, as the Torah in Judaism is much more than a set of laws. We can therefore see that the Torah, far from being a simple set of legislation becomes the revelation of God to the people ofIsrael. It included but was not limited to the Law that is so commonly thought to be the whole of the Torah. This is not to negate the legal aspect of the Torah, however, because the laws governing various aspects of Hebrew life were numerous and detailed, as can be seen by simply glancing through either the books of Exodus, Leviticus or Deuteronomy, where over 600 laws are set down for everything from dietary habits, war, criminal prosecution, land disputes and monetary issues. These of course would later be used by the Pharisees and Sadducees to gain greater political clout inJerusalem; thousands of extra laws dictating every possible action would be set down by these two groups and would be one of the main contention points for Jesus Christ and the Apostle Paul after the birth of Christianity. It can be seen then that not only was the Torah the foundation of the faith of Israel but it was literally the soul of the nation, and it was on the basis of Israel’s devotion to the Torah that Israel’s prosperity was built. It was an essential part of the fiber of the being of the Hebrew people, moreso than the Constitution is the America or any other founding document to any other nation; it is unique in the aspect that it is not the product of long philosophical thought or logical means to an end or the result of poetic mythologies to explain natural phenomenon, but rather the direct revelation of God to His chosen people. With that in mind it is easy to see why the Torah holds such an important place in the minds of the ancient Hebrews as well as in modern times. Schechter, Solomon. Aspects of Rabbinic Theology. Jewish Lights 1909/1993. Print. Apologetics Study Bible. HCSB.Nashville, Tenessee. Holman Bible Publishing. 2003. Print. That statement is an overview of Natural Theology, which must not be mistakenly seen as the only kind of theology or the only kind Aquinas believes is necessary. On the contrary, Aquinas defined “Sacred Doctrine” as the attributes and knowledge which God Himself can give. Sacred Doctrine consists of things of God which no human reasoning can begin to understand, and Natural theology consists of the things of God which human reason can begin to understand. Having established both of these doctrines, the question becomes: which is more important, and in what order should they be pursued? This point is a little more difficult; the ultimate goal of natural theology is to prove the existence of God by pure human reason, while Christianity is based in faith in that which cannot ultimately be proven, and so the two appear to be mutually exclusive. We can see that Biblical faith is not a mere belief, will to believe or blind belief in a lack of evidence; contrary to that it is trust by experience and through proof. Aquinas’s definition seems to err more on the side of pure belief, and this is the cause for his concern. Thus, natural theology would appear to be at odds with a belief system in which faith is defined as just belief in that which cannot be proven. The weakness of Aquinas’s system, therefore, was the thought that if God could be proven, faith would no longer be needed; this view, when examined in light of a Biblical understanding of faith, is false. However, as stated above, knowing and believing are only exclusive to each other if the definition of faith takes on clearly un-Biblical connotations. Neither can be seen to be superior to the other; without a personal trust, Christianity is mere intellectual belief, and without reasonable knowledge there are little grounds for faith. From a Biblical standpoint no faculty is exclusive to the other, and the above statement is confirmed that faith and reason are to work together. Aquinas certainly didn’t dismiss faith as unreasonable or reason as incompatible with faith, but his limited definition of faith forced him reduce faith a more blind belief , which practical and defendable to Aquinas is not an entirely Biblical model. The conclusion reached is therefore twofold: natural theology and Sacred Doctrine are to work in tandem and not merely picking up where one leaves off; and that a proper understanding of faith is necessary to reconcile the seeming differences and limitations of faith, natural theology, and reason. Aquinas, Thomas, Summa Theologica. B&R Samizdat Express. 2009. E-book. McInerny, Ralph “On Behalf of Natural Theology,” in Being and Predication. Washington,DC: TheCatholicUniversityofAmericaPress. 1986. Print. Zacharias, Ravi. Jesus Among Other Gods: The Absolute Claims of the Christian Message. Thomas Nelson Inc, 2002. Print. Anselm of Canterbury. The Devotions of Saint Anselm of Canterbury. New Century Books. 2010. E-book. Beowulf is considered the most important pieces of Anglo-Saxon literature for a number of reasons: it is the first epic poem written in the vernacular as well as the oldest English piece of literature currently in existence. However, it’s most often overlooked trait is that is also an example of fervent Anglo-Saxon Christianity and a brilliant example of primitive Christian fiction for the purpose of both defending and spreading the Christian belief throughout the pagan Scandinavian lands. That Beowulf borrows enormously from Christianity and the Bible is no secret, but these traits are often cited as mere influences and do not have any purposes beyond showing the fact that the author was devoutly Christian himself. 1. The author makes numerous attempts to show the superiority of the Christian god and the assistance given to those who follow Christianity, as the Anonymous poet tells us, “It was hard fought, a desperate affair that could have gone badly; if God had not helped me,” (1656-1657). Other themes of subtle contrast, comparison and praise for the Christian God abound and frequently echo Biblical styles and themes; lines 1724-1745 resemble both in style, tone and subject matter the Psalms of King David ofIsrael. It is quite clear however that this is not simply a tract for conversion since pagan influences do have a strong hold. The more destructive ones are not mentioned and the more positive ones are, i.e. swords and armor have names and characteristics and even personalities as is common throughout the medieval period; meeting halls are filled with mead and warriors eager for glory and celebration; camaraderie and a father-like love between a commander and his troops is often showcased. Thus, Beowulf is not just an anti-pagan tract, but rather a brilliant and subtle expression of Christianity’s superiority over the old pagan religions of the north. The Christian god is shown to not just be a powerful deity, but THE powerful deity, the almighty, who rewards valour and bravery in a far better way then the pagan gods of the time. Hence, Christianity is portrayed not as the weak kneed religion of the infidels, but rather as the powerful belief system of the hero of the Danes and Geats, Beowulf. This makes it a powerful and effective evangelistic story and one that clearly had a large influence on both the culture and religion ofScandinavia in terms of advancing Christianity as a legitimate religion. Alison Booth. Kelly J. Mays.New York,London. W.W. Norton & Company, 2010. 1088-1098. Print. Abraham and Isaac – Taken from Genesis 22. 1. Abraham is commanded by God, with whom he had a personal and deep relationship, to do something shocking, sacrifice His son, Isaac. 2. This has never been commanded by God (human sacrifice) and is strictly forbidden in Hebrew culture; this is NOT setting a precedent for child or human sacrifice. Trust God, whom he has absolute faith in by a lifetime of experience, that even though this is abnormal, shocking, heartbreaking and even wrong, God will remain faithful to him if he remains faithful to God. 4. Abraham elects to completely trust God, even going against his own reasoning, because God has been faithful to him to the extent that Abraham knows He can be totally trusted. 6. Abrahams absolute faith and trust is credited to him as righteousness and lays the foundation of the Gospel; that we are made righteous before God by faith.